The Symbol Nomenclature For Glycans (SNFG) facilitates the efficient communication of carbohydrate structures, and has become widely accepted by the glycobiology community. The system is fully described in the NCBI text Essentials of Glycobiology. Note: VMD installation is discussed in the documentation of Ancilliary Software. Two options are provided that differ by the VMD ‘default’ settings. Option 1 only includes the 3D-SNFG representations, and maintains the original settings for VMD. Option 2 contains the 3D-SNFG script, as well as a few aesthetic changes that are loaded at startup (i.e. white background, automatic representation of proteins with NewCartoon, etc.). The 3D-SNFG representations are identical in both cases. Details: A vmdrc file allows you to customize the default settings of VMD. 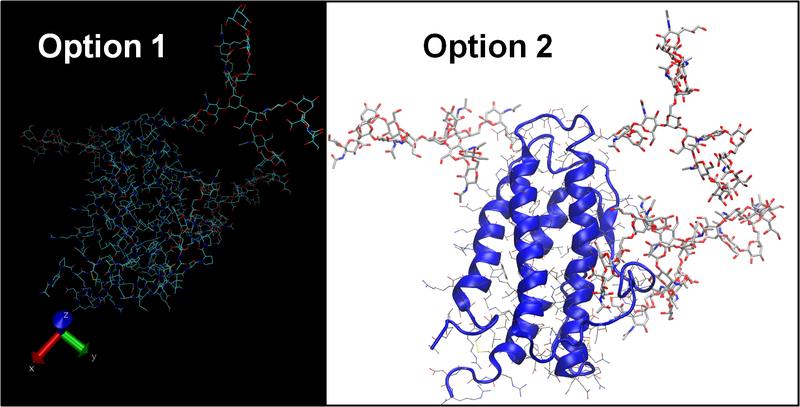 Option 2 initializes multiple representations in order to display the protein backbone as a cartoon, side chains as sticks, and all other atoms as licorice. The background has been changed to white, labels to black,, and display set to an orthographic view. Other options can be useful, such as changing the size and position of windows. Experienced VMD Users: You can source the 3D-SNFG script within your personal vmdrc file. The provided vmdrc files consist of two parts, the initialization of VMD and the 3D-SNFG tcl script. Rename the provided vmdrc file 3D-SNFG_v1.tcl, and remove all of the lines above ‘# Load the 3D-SNFG script’. Now source this script within your personal vmdrc. Move the file to either your home directory, or the location where the VMD software is installed, and unzip the file. Note that the unzipped file is named .vmdrc on Macintosh and Linux systems. A period that precedes a filename designates the file as “hidden”. Although the unzipped contents may appear empty, the file will be recognized by VMD. Are structures available to test my setup? Does the code discriminate between D- and L- residues? How were the sizes of the 3D-SNFG shapes selected? How are modifications represented (i.e. sulfate and phosphate)? How do I draw 3D-SNFG objects on a molecule other than the most recently loaded file? How do I change the shape of an unrecognized residue (flat, white hexagon)? What does “ERROR) No molecules loaded” mean? Why are some of the shapes missing? Why are all of the shapes missing? How are the shapes built? If you have any issues that are not covered in the FAQ, or would like to provide suggestions for the representations, please contact us. Posted on June 3, 2016 by david.